The new Sanimatic WC from Saniflo can adjust its height to the needs of the user. 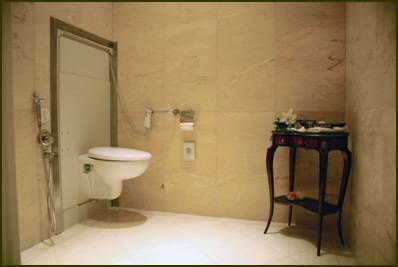 The height of the WC is adjusted by a handheld remote for customized ease of use. Sanimatic enables the user to adjust the seat height up and down whilst seated, and also to flush the WC without having to turn or stretch. The units can be wall mounted or recessed. Optional arm rests can be fitted should they be required. To complement the WC, the Sanimatic wash hand basin enables the user to move the wall hung unit by use of a corded remote control. The Sanilife range has been designed to be aesthetically pleasing as well as practical, a new concept considered to be ideal for any property. The versatility of these designs makes them perfect for use by the whole family. Sanilife an inclusive bathroom solution for you and yours, enabling you to enjoy your home forever. This press release was distributed by ResponseSource Press Release Wire on behalf of Consortium Communications in the following categories: Children & Teenagers, Men's Interest, Health, Home & Garden, Medical & Pharmaceutical, Public Sector, Third Sector & Legal, Construction & Property, for more information visit https://pressreleasewire.responsesource.com/about.